Inside: Find out the best time to buy fruits and vegetables to get the best price so you can stock up and save money. Farmers markets are starting up again here and I’m looking for a change of pace from stocking the usual apples and oranges for fruit and broccoli and spinach for our veggies. Those aren’t bad options, they are just what I gravitate to at the grocery store because they are reliable standards that will get eaten. However, we all need a bit of a change now and again. Not only that, but being aware of what fruits and vegetables are in season can help us both expand our palettes and lower the costs of our purchases. Have you ever tried to buy a butternut squash in June or strawberries in November? The squash is hard to find and, if you do find some, it’s expensive. Buy it in June, you can expect to pay over $2 a pound, whereas in November, I can get it for about 0.79 per pound. It’s the same with strawberries. And let’s face it, the ones available in November are just not very tasty at all. 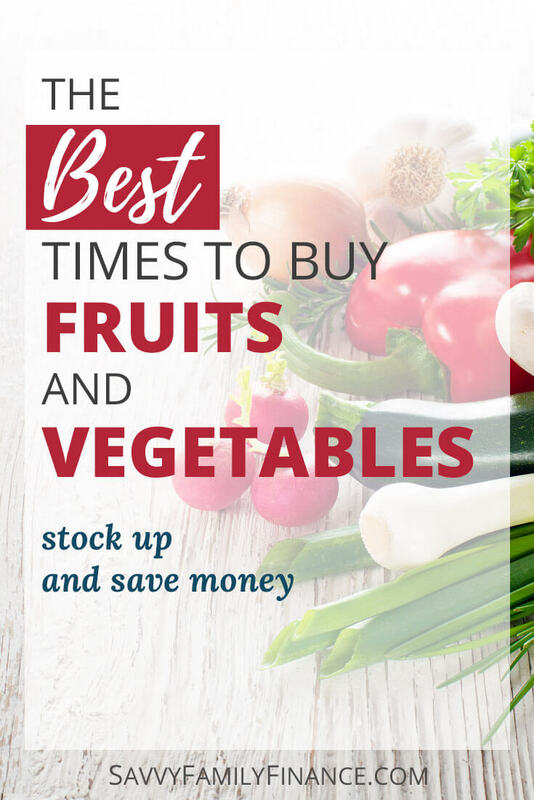 Buying produce when it’s in season is a great time to add variety to the menu and stock up on produce for canning or freezing to use later. During nice weather, it’s fun to go to the farmers market to check out the produce and usually there are other food vendors, music, along with games and crafts to entertain the kids. Even without farmers markets, this is a good guide for planning trips to the grocery store and meal planning for the season. Though you won’t find oranges at farmers markets in Minnesota, you’ll still find the best deals on citrus at the store in the winter. This list isn’t everything, but it lists popular items. For a more specific breakdown of what’s in-season in your area, check out the Seasonal Food Guide.